Every morning Alyssa wakes up in a body that doesn’t outwardly look medically complex, but her genetic disease, Cystic Fibrosis, dictates how she lives her life anyway. Cystic Fibrosis (CF) is an autosomal recessive genetic disease that impacts 70,000 people worldwide by causing a malfunction in the protein that allows sodium chloride to properly move through the body’s cells. Excess salts cause a thickening of organ lubricating mucus, wreaking havoc in multiple systems, with the greatest concerns being in the respiratory and digestive systems. Mucus in the lungs creates an optimal environment for nasty bacterial overgrowth, leading to life threatening lung infections. Mucus in the digestive tract clogs bile ducts and the pancreas, causing difficulty with food digestion, weight gain, and long term diabetes and liver issues. When Alyssa was younger she relied completely on us as her parents performing manual chest physical therapy (CPT) on her by pounding on six specific spots of her chest and back to vibrate loose the mucus from different locations in her lungs. This effective form of airway clearance can be taxing on the caregiver, and provides no opportunities to independence for older CF patients. As she grew, Alyssa was able to get The Vest system, a form of high frequency chest wall oscillation. The Vest is an inflatable jacket that attaches with hoses to a large compressor, which forces air into the vest and vibrates at variable frequencies in attempts to loosen the mucus. The vest treatment takes 30 minutes to run through the protocol of various speed and pressure settings that are optimized for helping to expel the sticky mucus. On days when time is not available for a vest treatment, Alyssa chooses to use her Flutter, an oscillating Positive Expiratory Pressure (PEP) device. As Alyssa blows into this handheld PEP device, it creates a vibration in both the large and small airways, dislodging and moving mucus so that it can be coughed out. The breaths through the device are alternated with active huff coughing to maximize its productivity. 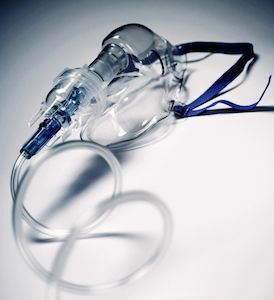 Other PEP devices include the Acapella, Cornet, and Intrapulmonary Percussive Ventilation (IPV). PEP cycles can be completed in 5-8 minutes when done by a patient who can actively work to clear his or her own secretions. Newer treatment options are under study right now. The Frequencer is a relatively new device that uses low frequency sound waves to vibrate the areas of the lungs. The Frequencer was developed by a CF patient who spent time at music concerts and realized that sitting near the speakers actually helped to clear his lungs better than traditional treatments. Ongoing research in this area is showing promise, and insurance companies are recognizing this type of treatment as a viable option worth the financial cost. The Frequencer and similar devices promise to cut treatments to about 12 minutes, as you use a wand in designated spots on the chest and back to target areas of the lung where the mucus may be causing obstructions. Also being studied for adoption are mechanical percussors and other soundwave-based technologies. Once Alyssa completes her airway clearance and the accompanying morning nebulized medicines, she must begin the arduous process of eating enough calories to sustain her body for the day. Children with CF consume a minimum of 3,000 calories each day, and adults must consume between 7,000-10,000 calories a day just to maintain their small frames. Alyssa, like many other children with CF, had a feeding tube placed when she was a toddler so she could get extra calories and nutrition while she slept. At eight years of age, Alyssa was able to consume enough calories orally to have the tube removed, but the likelihood of replacement at some future point is high. Today she eats a high salt, high calorie, high fat diet. While the average person might feel a sense of jealousy that Alyssa can eat such rich and decadent foods without gaining unwanted fat, Alyssa routinely wishes she could just have a piece of fruit or some plain, undipped and unbuttered vegetables. Days with CF are pretty normal looking, until they aren’t. Unless she is actively sick, Alyssa is able to keep up with her peers and function relatively well. When healthy, if she stays active and gets daily exercise, she is able to limit her treatments to just twice a day. When sick, she must perform her 30-60 minute nebulized medicine and airway clearance regimen up to four times each day. Sicknesses with CF often lead to hospitalizations and 14-21 days of IV antibiotics. Children with moderate or advanced lung disease CF eventually need occasional or regular oxygen supplementation. Treatments for airway clearance are necessary, but the thick, sticky mucus is constantly forming and causing medical complications along the way. Children and adults with CF lose a little lung function each year, resulting in a large percentage of patients reaching end stage or needing lung transplantation by their mid 20s. A new medicine, Kalydeco, was introduced into the market in 2012. The groundbreaking Kalydeco corrects the defective protein that causes CF in 4% of the CF population. This medicine has not been shown to be effective for patients like Alyssa, but studies are underway to find synergistic medications that will work with Kalydeco to widen the group that will be helped. We are hopeful that some day she will be able to replace her hours of daily treatments with a few pills, and that the days of CF ending in transplant or early death will be history. Heather Walter is the mom of three kids, one with Cystic Fibrosis. In addition to her job as an Associate Professor of Communication at the University of Akron, she serves on the family council at Akron Children’s Hospital and works closely with her local Cystic Fibrosis Foundation to help educate others and raise funds.